This page contains the rota spreadsheet for St Peter & St Paul's covering the work of the great number of volunteers that help keep the church running and looking really good. 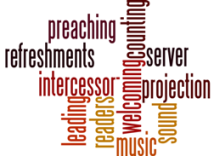 Everything from music to serving teas, from projection to preaching. The file is intended only for those on the rotas and is password protected to maintain confidentiality. Please contact Moyra Pollard for the password if it has not already been sent to you. Please note that this file is intended to be readable by most computers and laptops however it may not be displayed correctly on some tablets and mobile devices. Please contact the office if you are having difficulties.